Evans Gambit Accepted - Chess Gambits- Harking back to the 19th century! With 4...Bxb4, Black grabs the gambit pawn and hopes to withstand White's impending build-up in the centre. Nowadays Black most often accepts the gambit with the aim of returning the pawn at a good moment in order to equalise or get a positional advantage, but there are also lines in which Black holds onto one extra pawn. It is rarely advisable, however, for Black to attempt to gobble up additional pawns. Following 5.c3, Black has a choice of posts for the c5-bishop. This is the most critical line. Black envisages that after 6.d4, White's c3-pawn will be pinned against the white king, and that this will narrow down White's options. Black can then consider 6...d6, reinforcing e5, whereupon play normally continues 7.Qb3 Qd7 (7...Qe7 is dubious because of 8.d5). Then the old main line continues 8.dxe5, but Black has been doing well recently by returning the pawn with 8...Bb6 instead of holding onto it with 8...dxe5, so in recent years grandmasters have been using 8.Nbd2 instead, persisting in sacrificing a pawn for compensation and waiting for a better moment to consider taking on e5. The theoretical standing of this line is currently unclear. 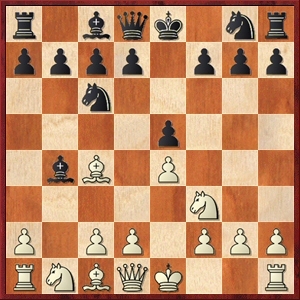 Most popular though is 6...exd4, whereupon after 7.0-0 dxc3 (this is known as the Compromised Defence) 8.Qb3, White gets a very dangerous attack, so Black normally refrains from taking on c3 and instead plays 7...Nge7, intending 8.cxd4 d5 9.exd5 Nxd5, or 8.Ng5 d5 9.exd5 Ne5, where White is usually able to regain the sacrificed pawn but Black is able to achieve equal play without much difficulty. Alternatively Black can head into the so-called Normal Position with 7...Bb6 8.cxd4 d6, in which White relies upon control of the centre to compensate for the sacrificed pawn. 9.Nc3, favoured by Morphy and Chigorin, is probably the most reliable continuation for White. This variation is a good way to play for a win as Black since it is one of Black's few reliable defences that isn't based mainly on returning the pawn and reaching equality. Thus White often prefers 7.Qb3, after which Black deals with the threat to f7 with either 7...Qf6 or 7...Qe7, leading to complex and equal play. Play will generally continue with 8.cxd4 Bb6 9.Nc3, sacrificing a second pawn (at d4) for an accelerated initiative. While the resulting positions should be equal with best play, it is far more difficult for Black to engineer a way of returning the pawn and reaching easy equality than in the 7.0-0 Nge7 variation. White can instead play 6.0-0 preparing d2-d4 on the next move, but then Black plays 6...d6 7.d4 Bb6, heading into Lasker's Defence, inviting White to regain the pawn with 8.dxe5 dxe5 9.Qb3 (analysed by Chigorin, instead if 9.Qxd8+ Kxd8 10.Nxe5 Nf6) 9...Qf6 10 Bg5 Qg6 11 Bd5. Now 11...Nge7 12 Bxe7 Kxe7 13 Bxc6 Qxc6 14 Nxe5 Qe6 leaves Black's king exposed, and White with two knights against two bishops, giving dynamic equality, but Mihail Marin's suggested improvement 11...f6 probably gives Black the advantage, so White should avoid this line. This has little independent value, as it tends to lead into the Normal Position after 6.d4 exd4 7.0-0 d6 (again it is very dangerous for Black to take on c3 here) 8.cxd4 Bb6. It does, though, have the advantage of making 7.Qb3 less effective as the c6-knight can get to a5 more quickly. This line is often favoured by grandmasters, as Black has plenty of scope to return the pawn with the aim of reaching equality, but it is not as serious a test of the gambit as 5...Ba5. Play tends to continue 6.d4 Na5, counterattacking against the bishop on c4. 7.Nxe5 Nxc4 8.Nxc4 d5 9.exd5 Qxd5 10.Ne3 is then the traditional main line, where White gets a strong centre but Black gets the bishop-pair. Instead, Garry Kasparov tried out 7.Be2! ?, against which Black should probably reinforce the e5-pawn with 7...d6 rather than heading into 7...exd4 8.Qxd4. The modern preference among grandmasters appears to be 7.Bd3, which leads to approximately equal play after 7...d6 8.dxe5 (If White would rather persist in playing for compensation for a pawn then 8.Qa4+ and 8.0-0 are worth investigating) 8...dxe5 9.Nxe5, though in the notes to Short-Bruzon Batista I have suggested a possible improvement over Short's play which may give White chances to "make something happen". White's main alternative is 6.Qb3 attacking f7, with the idea of 6...Nh6 7.d4 Na5 (a standard motif, forking the queen on b3 and the bishop on c4 and thus getting the bishop-pair) 8.Qb5 Nxc4 9.Bxh6, creating disruption on the kingside in return for surrendering the bishop-pair. However, I don't really trust this line for White, for Black can continue with 9...gxh6 and then play ...Rg8, making use of the half-open g-file. This is an unusual sideline in which Black aims to maintain the strong-point on e5, but by placing the bishop on d6, Black blocks the d7-pawn and so developing the c8-bishop is often a problem, and Black often gets into a difficult tangle into the early middlegame. White has to play actively, however, to demonstrate the drawbacks of Black's plan and prevent Black from unravelling and reaching a solid pawn-up position. 6.d4 Nf6 7.0-0 0-0 8.Re1 is the usual continuation, with White relying on the strong central control to provide compensation for the sacrificed pawn.